The problem? We may miss opportunities to learn about people from other cultures, races, and ethnicities. We may miss opportunities to connect with the global church - our own denomination, sometimes. We may miss opportunities to connect with other churches, right in our community, that serve a different population. If you agree, I invite you to consider ways you might able to develop and embrace multiculturalism in your church community. With the state of our country and our world right now, we need things that bring us together. Things that bridge the divide so many of us feel in our neighborhoods and cities and communities. We need to do what we can to learn about people who are different from us, to become aware, to notice, to include. Reach out to other churches (of different denominations and cultural backgrounds) in your area to discuss ways to collaborate, learn from each other, and make music together. Invite people with a unique cultural heritage to come and speak to your choir (or congregation) and provide insight into the music you're singing. Contact your denomination for global resources and contacts at churches around the world. Start a conversation. Forge new relationships. Make connections. 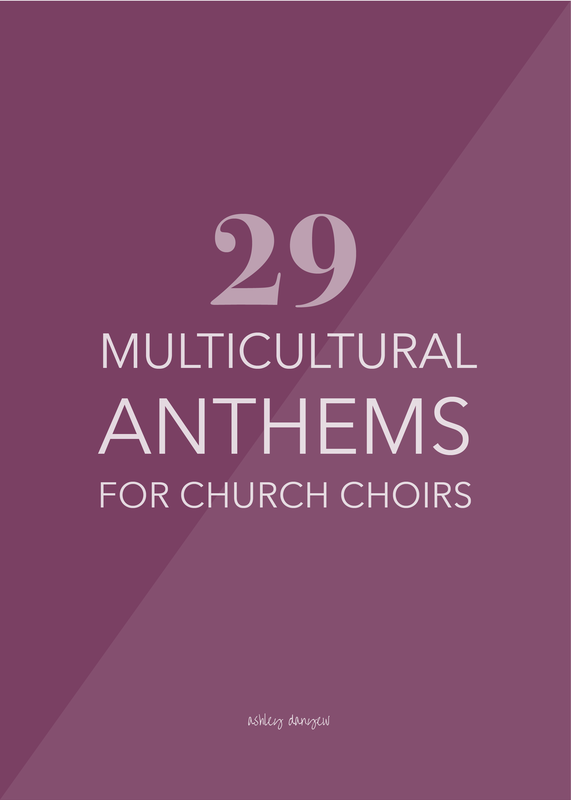 To help you get started, here's a list of 29 multicultural anthems you can sing with your choir (or a combined community choir! ), including African, Hebrew, Caribbean, Spanish, and Italian music. Based on a single line of text, bwana asifiwe (praise the Lord), and set to a simple, repeated melody, this anthem would be great for an older elementary choir or youth choir. The parallel 3rds make the part-writing a little more challenging. I love that the traditional text and tune of “Praise to the Lord, the Almighty” is woven in (in an African style) towards the end. Easy-to-pronounce text and very repetitive vocal lines make this anthem accessible and easy to learn. Underscored by driving, interesting rhythms and colorful piano harmonies. With text based on Deuteronomy 6:4-5 and melody based on a traditional Tanzanian tune, this anthem starts with a single voice and gradually builds, layering in parts and sections and growing in energy and excitement to the end. This anthem begins simply (and rather slowly) with a solo voice or unison choir, followed by an easy-to-learn 4-part choral texture. The piece builds by adding in African percussion and an increase in tempo, building the 4-part texture, top to bottom (S, then SA, etc. ), and finally, layering in contrasting echo parts, very characteristic of this style. Read more about the history of this hymn here. Based on a traditional Zambian folk song, this anthem will provide a great rhythmic challenge for your choir (don’t worry: the text and rhythmic phrases are repetitive enough that it’s still doable). Flexible voicing means you can simplify the vocal parts and provide more support for fewer sections, if you’re working with a smaller or less-experienced choir. Would be great as an opener (maybe a processional?) or closer for a special service or music program! A great processional, this anthem, based on a song from Zimbabwe, features lots of percussion and Orff instruments - great for an intergenerational worship experience! Repetitive instrumental and vocal parts are easy to teach and learn. An energetic call-and-response anthem with accessible part-writing and repetitive rhythms. A classic by Hal Hopson, this setting of the traditional Zulu song, “Siyahamba” features the text in both Zulu and English and a nice constrasting section in the middle with text based on Psalm 27:1-4. Flexible voicing makes this anthem feasible for groups of all ages and sizes. A great way to introduce part-singing to your children’s choir, this partner song incorporates a Swahili text (set to original music) and a traditional children’s song (God Is So Good). An exuberant celebration of Christ’s birth with repeating chorus, repetitive rhythms, supportive piano accompaniment, and accessible part-writing. Sung in traditional call-and-response style, the text is presented first in Swahili, then repeated in English. “Come to the waters, the waters of life; we live refreshed, renewed; by dying with him, we are raised with him, Christ Jesus our Lord. We are healed; we are made new. We live with Christ Jesus our Lord." The four Swahili words used in this piece translate as "We will dance! We will sing! We will be glad!” Accessible (and repetitive) part-writing makes this anthem a great choice for youth choirs. Listen to a recording here. Another great partner song by Mark Burrows, this one starts with the familiar text and tune of “What a Friend We Have in Jesus” (first verse), followed by a repeating phrase of Swahili text, set to an original tune. The two parts come together at the end. The text of this Israeli folk song is based on Song of Solomon 2:16, 3:6, 4:9, and 4:16. A recurring chorus (the first half of which is in unison) makes this piece easy to learn and accessible for smaller choirs. Lyrical, haunting choral parts bring out the sacredness of the text, drawn from the Jewish liturgy. The optional instrumentation adds color, texture, and richness to the anthem. Dance-like melodies, syncopations, and a notable clarinet obbligato make this anthem very characteristic of Klezmer-style music. The text is based on Psalm 133:1: "Behold, how good it is for brethren to dwell together in peace." This catchy anthem features a traditional Caribbean tune and text, plus original music and text (based on Psalm 150) by Hal Hopson. Great for children’s choir or a combined group! Beautiful, close harmonies in the vocal parts are indicative of the text from Matthew 18:19-20: “Where two or three are gathered in my name, there will I be also.” A favorite! The verse-chorus structure of this anthem makes it easy to learn and teach. The verses are written in English (a great way to feature soloists or small groups) and the chorus has both Spanish and English text included. 2-Part, 3-Part Mixed, or SATB Choir with Piano and opt. A beautiful, lyrical setting of a traditional 16th-century Spanish lullaby. This would be lovely for a Lessons and Carols service! A singable arrangement of the traditional Spanish hymn found in the United Methodist and Presbyterian hymnals. Includes a reproducible part for the congregation to join in. An energetic, joyful, and catchy setting of a traditional Spanish carol, the minor mode and accessible part-writing make this a great teaching piece for your children’s choir or youth choir. It would also make a great summer anthem for your adult choir! A creative medley of three traditional Spanish carols, with text in both Spanish and English. Includes De Tierra Lejana Venimos (from Puerto Rico), Oi Betlehem (from Biscaya), and Fum, Fum, Fum (from Spain). Based on a traditional Spanish carol (A La Nanita Nana), a percussive keyboard accompaniment provides contrast with the lyrical vocal lines. Sing it in Spanish, English, or a combination of both! Fun to sing and learn, this joyful anthem features a rhythmic chorus, contrasted by a legato middle section. A creative setting of a great text! A dynamic and memorable setting of the traditional Catalan carol. Surprising rhythmic and meter changes and a sparking 4-hand accompaniment make this anthem challenging, but very rewarding! A well-crafted arrangement of this familiar Spanish carol, featuring authentic Spanish rhythms, singable melodic lines, and rich instrumentation. Use the unison version with your children’s choir and the SATB version with your adult or youth choir for an intergenerational experience! Listen to a recording of the SATB version here. Great for a women’s trio or ensemble, this Italian Christmas carol features a sweet, lullaby-like section, contrasted with an upbeat “fa la la” section. What are your favorite multicultural anthems for worship? P.S. Looking for multicultural hymns? Here's a helpful index for the United Methodist Hymnal, categorizing hymns by musical style, ethnic origin, or language.